One feature that hasn't been discussed in the previews is Research and Advancement. Research allows wizards, engineers, fixers, and anyone else with the right skillset to improve designs, change the economy, and give your organization a potentially killer edge. If you have read the Combat Primer or the other previews, you know that the items, buildings, troops, and economic processes in SK are ranked by wealth level. For example, a subfusc peasant's shirt is wealth level 1, a roofsword is wealth level 3, throwing a holiday parade and increasing the mood of everyone in the city is wealth level 8, and a borderlands keep is wealth level 12. Each item also has a quality. Higher quality weapons can do more damage against weak armor, and higher quality keeps can withstand more trebuchet boulder or cannon shot impacts. Research allows you to improve the quality of an item or decrease it's wealth level: not just one item but every item of that kind bought, made, or sold by your organization. Not just that, but research also allows troops to be more effective in battle (increasing the attack or defense die of a maneuver or stance), improves the effectiveness of spells, and can even discover new methods of communication, transportation, and wonders of the world. I love watching a change from research shade the campaign. Suddenly, those pikemen are something to be concerned about on the battlefield. Suddenly, that guild boss who snubbed yuou at the Neverlight Festival is fawning and petting your tricorner hat because your trading company is the only one that can build high quality wheellocks. Research can make your organization rich, and it can even increase your organization's scope. Of course, with power comes risk. You become a target for espionage and sabotage. Navies might even embargo you, and kingsmen might hunt you down, if a noble decides that you threaten his own kingdom's products. But all of that is just good fodder for roleplay and story hooks! The mechanics of research are simple. Roll your researcher's relevant skill (or your organization's relevant characteristic). If you beat the quality of the item you are trying to research, you have invested one point in the research. Do that again next week, and you've invested two points in the research. Once your invested points equal the quality of the original item, your research is done. That's it! There are a few other aspects to research as well, and of course you can research and create your own new spells, buildings, vehicles, and more. The main conclusion to draw is that it allows the campaign to never get stale. Research can turn even the most backwater noble famnily into a new political powerhouse. New weapons, spells, vehicles, war beasts, and even civilizations are possible. Two campaigns that start out with the same characters and kingdoms might go in totally different directions depending on who researches what advancement first. That's going to have to do it for today's preview! And since it's only a little bit before Gen Con... I will see you there! It's time to take a look at how to run a Kingdom! For this preview, we're going to use the sample kingdom of Thyre. Thyre is a northern city-state with a large protectorate. Thyre is famous for three reasons. First, power. It dominates the northwestern Claw. Its engineers are the only ones able to rival the engineers at the university in Queensport, far to the south. What they lack in scholarly rigor, they make up in practical bullheadedness. Thyre is also famous for its freedom. Thyre's king, Jacen III, allowed the Grenmarch to secede from the Protectorate. Thyre also anchors the western end of the Free Road trading path. Third, and ironic in light of the second point, is Thyre's education system. Thyre's education system is mandatory, aggressive, and cruel. Because Jacen has no mind to police his populace as strongly as Akra, Marnh, Valte Riel, or any of the other kingdoms, he instead extirpates dissidents early. There is more on Thyre's education system in the book, including how it uses exclusion, isolation, and mockery to twist and destroy developing minds. For now, let's look at how the kingdom might look to a player with a high-level character making an impact on the world political stage. If a kingdom is a house, then organizations are the beams that hold up the walls and the roof. Knowing them and playing them against each other are essential tools for the politically active. There are seven organization types that can operate within your kingdom, including noble houses, trading companies, and secret socieities. Each is defined by five characteristics: scope, efficiency, force, arcana, and shadow. The characteristics are important in a number of ways. Organizations might roll efficiency checks to survive or even profit in a city under siege, or they might roll an efficiency check to reduce the gold needed for a new building. Belligerent organizations can sometimes replace a troop's attack or defense roll with the commanding organization's force roll. If you want to run a kingdom, you had best be ready for many different organizations targeting you. The reason is obvious: it's good to be the king. The king can change the very Doom of the land, set the culture, influence the economy, tap into the treasury, and ruin rivals on the grid of the Exchequery. •	Change the mood of a Kingdom. •	Establish and enforce law. •	Inflate regional prices and depress a region’s economy. •	Settle a new city. •	Generate wealth – or destroy it. Basically, asking "What can my organization do?" is like asking "What can my character do?" It can do anything that you and the GM judge entertaining and plausible. There are rules and examples provided for shadow wars, war, recessions and economic booms, industrial research, social engineering, and of course guild-on-guld violence including theft, assassination, and sabotage. There are strong links that bring organizations down to the level of individuals. At the end of the day, SK is a game about individual characters. So there are options for organizations to boost characters' power, reputation, skills, and more. Running a kingdom is usually done by the most powerful organization in the capital. Often that is a noble house, although in several kingdoms the noble houses are puppets and the true power lies with a secret society, a wizard, or an oligarch. The ruling organization has a large responsibility in the eyes of the people to control the natural magic disasters that plague the Claw. This chiefly revolves around controlling the number of spellbound in an area. How you choose to control the spellbound says a lot about your regime. Choose wisely! The walled cities, the castles, and the fortified chateaus of the Kingdoms testify to a history of violence. Open war between kingdoms has become somewhat less common over the last century or two, but the threat of mass combat does not come only from the infantry and cannon of foreign powers. Magical disasters that produce mass enemies are not common, but they are horrifying enough to influence city design. Ghoul hordes that spawn in graveyards and chase down citizens, eating them in the streets while the survivors flee toward the alarm bells and closing portcullis of the city keep, are just one example of a magical disaster that needs to be dealt with through mass combat. Mass combat in Spellbound Kingdoms is tactical, fast, and seamlessly integrated with the rest of the game. There are two parts to the integration: building up forces and actual mass combat itself. Building up forces is straightforward. Each combat troop has a mustering cost and a maintenance cost (represented by its required wealth level), and there are limits on number and type of troops determined by your legion and your commanders. All of this uses the statistics that are already present in other parts of the game, making recruiting, training, and maintaining a legion quick and easy. One of the features of the mass combat system that is a lot of fun is how war has a ripple effect on the regional area. Economy, culture, themes for social encounters, spellbound creatures for magic, reputations, and a lot more are affected by war. When you’re in a region at war, you can feel the difference. The mass combat system encourages series of battles that make up a larger war. You can run an entire campaign during a war, with different battles, action taking place during the battles and after, in the theater and outside of it. Tactics originate in several mechanics, including movement. I usually use a quick, hand-sketched map for a mass combat scene. Areas are abstract, just like the areas for individual combat in the Combat Primer. The stance and maneuver system generates a lot of tactics too. Each round, your commanders issue orders to your troops using a pool of command points determined by your armed force, your leaders, and any damage (such as an enemy assassin cadre targeting your officers). Stances are default positions; they do not require you to invest command points. Each troop has several different stances, however, and selecting the right one is important, especially if your commanders’ attention is going to be elsewhere. Maneuvers and movement require your commanders’ attention. Most cost only one command point, but a few cost more. In a typical round, you might have three or four command points, so there is not a lot of bookkeeping involved. Pick your stances, choose three or four maneuvers, and you’re all set to go. At the same time that you’re doing that, the other side is picking his maneuvers too. This is, again, like the Combat Primer. I like this simultaneity for the dramatic “reveal” moment, but I also like it from a game design standpoint because it means no one has to wait ten minutes for the initiative order to come round to his turn again. Here are two typical troop stat blocks. Ok, that's going to have to do it for another preview. I hope you're enjoying them. I can't wait for the game to come out at Gen Con. See you in the forums! Now let’s take a look at a class that is at the heart of the current state of the Kingdoms: fixers. “History is breaking, and fixers are to blame. For centuries, there were wizards, witches, and everyone else. Eventually engineers began to part the clouds with their zeppelins and bombard walls with their cannon, but even then the kings scorned these rude mechanicals as tools to be manipulated. Fixers are different. Fixers have always been moving in the undercurrents of society. The first King Below in East Fire was an alchemist. There are alchemists’ marks on the walls in the Old Bastion in Thyre, and there are places in ancient Varteka and Muda-tarsk where the cisterns still reek of muriatic acid. Not until recently, however, did alchemy have the power to transmute a man into a quick-ruby golem. Not until recently did alchemy have the power to dissolve spellstalks, stop the blink, quench madfire, and chase the haile addaka. Not until recently did alchemy have the power to cure magic. Fixers are the apothecaries, surgeons, fences, and sages of the underworld. As you progress as a fixer, you learn to distill power from the natural world. You refine the natural and create something more than natural. 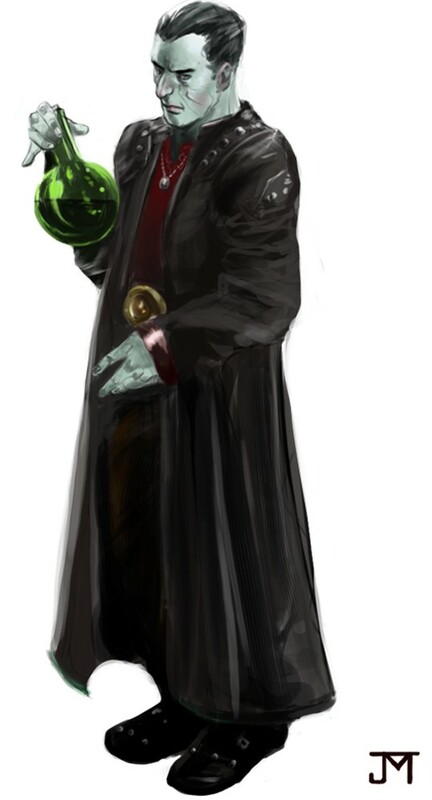 One of the fixer’s signature class features is his arsenal of alchemical wonders. A fixer can poison the well and the townsfolk will be hallucinating for days. Transmutation, paralysis, and petrification are all possible. So is beautification – cosmetics, including masks and tattoos of various powers, are within the compass of a fixer’s power. With difficulty, a fixer can cure some magical diseases. He can also effect some injury recoveries, although there is no equivalent to an “extra-healing potion” or anything of the sort. It is more difficult to heal the body than to harm it. A fixer’s life is more than elixirs, dusts, and sticks. Fixers have traditionally operated at the fringes and in the undercurrents of society. As such, fixers learn fighting styles along with shadow and social talents. Like the seradynn trolls, fixers provide a lot of built-in options for roleplay. The persecution of kings is certain, unless you ally with them (which brings a host of its own roleplay possibilities). Adventuring opportunities seek you out: enraged wizards, supplicating cripples, and desperate children. It’s up to you what you do with them. Here's our game-mechanic update for the week! This time it's social combat.First, I have to be totally honest: I have an absolute blast with social combat in SK. I <3 it. It just rocks. Social combat in SK is a hybrid between “Roleplay for a while then roll a diplomacy check” and traditional RPG physical combat. Words are weapons, and anecdotes are attacks. Your opponent wounds your psyche and your social standing instead of your body. As you wear your opponent down, he has to choose: take more damage (mood, but also heart, reputation, and more) or acquiesce to your point of view. Mechanically, a social attack is often a Charisma roll with a bonus die, defended by a Charisma die with a bonus die. The bonus dice are where things get interesting. First – and more mundanely - there are themes. Themes can come from the current adventure or the current environment. Let’s say your current adventure has the themes of intimacy, hope, and fear. If someone hits on one of those themes in his roleplay, he gets that bonus die. It’s a fun challenge as a player to try to steer your roleplay toward certain themes, and it also makes sure that the themes the adventure aims for actually come up in the roleplay. Second – and less mundanely – there are improv games. These games are optional. I love them, but they’re optional, because some people don’t love them. So let’s be clear: social combat is still fun and robust without them. Without improv games, you can still “disarm” someone of their fashion bonus by wearing the same dress to the party, for example, or you can reveal a secret to stun your opponent and get two attacks in a row, or you can “power attack” by investing your reputation in the scene. You can also emotionally invest yourself and risk damage to yourself to gain an advantage. You can seduce someone to force them to abandon an old inspiration and take a new inspiration point in “Love for [you].” You get the point: the system is plenty robust without improv games. But oh, improv games can be lots of fun. The simplest one is Lines. Here, everyone gets a few unique printed out lines that reinforce the themes of the adventure or session. Then, if they can work those lines into the roleplay, they get a bonus die. Big dice correspond to hard (or fun!) lines. Another improv game is Rudolph. In Rudolph, all the characters start the social combat with a disadvantage: a chocolate smear on your dress, a sneezing fit, or a negative reputation with an important NPC. Then, if you can turn your disadvantage to an advantage during the course of the scene, you get bonus dice. For example, the young lady with a chocolate smear on her dress might use it as an excuse to chat up the baron and get on his good side by offering her bodice to his roaming hands, all in the name of a good cleaning. Like I said, improv games in social combat are optional. They certainly aren’t to be used every time. In fact, many social encounters are just one and done – a quick attack, and instead of losing mood, someone caves. But improv games are fresh and fun to have around when the time is right. I hope when the book comes out that you give them a try! If you have read some of the information in the FAQ, you know that magic in the Kingdoms is a menace. It is a great power, and properly commanded, it can save lives. But it can also burn down a city of 50,000 overnight, swallow ships at sea with no warning, and rot the flesh from an otherwise healthy child. Yet many risk misery and death to learn just one spell. There are two rules of magic: “Magic hates magic,” and “Magic, to be commanded, must be obeyed.” Let’s look at some mechanical consequences of each. Keep in mind that this is a preview, not the entire section on magic from the final book. Still, it gives you a good idea of how the mechanics work. Magic hates magic. Magic that is not natural – a troll’s regeneration, or someone with the blink, for example – interferes with other magic. This interference can cause a wild surge and weaken the magic’s intended effects. When you cast a spell, compare your attack roll or magic roll to the number of spellbound creatures and objects in the area. If your roll is lower, then you have caused a wild surge. The wild surge has a form narrated by the GM or the player (and sometimes modified in important ways by environmental factors). To resolve the wild surge, roll a second time the same die that caused the surge. This is an attack against every creature in the area, and it deals damage accordingly. If your second roll is also below the number of spellbound creatures and objects in the area, then your original spell decreases all its numerical effects by one. There are many times that environmental factors modify wild surges. Some places – like the mummy’s tomb in The Dead King – have particularly nasty consequences for wild surges. Also, keep in mind that when calculating the number of spellbound creatures and objects, areas in combat and for “close” spells are smaller than areas used for “high” spells. Magic, to be commanded, must be obeyed. This rule means that you are marked and vulnerable to some magic once you learn to cast spells. You become spellbound, and certain spells have increased effects against you. Of course, there are benefits to being spellbound, chief among them, you can cast spells. 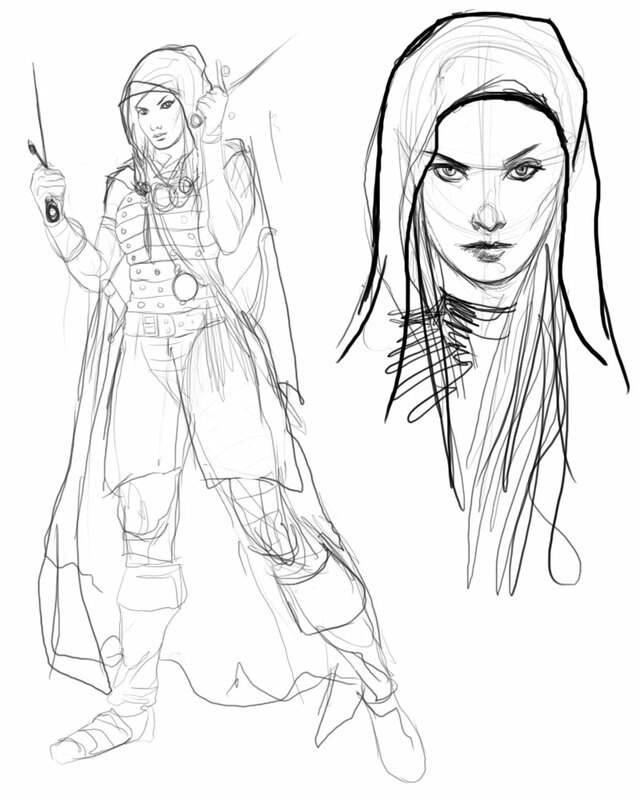 Rogues and assassins represent one of the “dual classes” of Spellbound Kingdoms. The two classes advance on the same level chart, but when signature abilities are gained, they differ. “In public, the Kings denounce thieves guilds, issue proclamations decrying the sins of the underworld, and sign treaties forbidding the use of assassins in domestic affairs. In private, the aristocracy delights in the company of rogues – many are rogues – and would not know what to do if there were not an assassins’ brotherhood to provide a soupcon of lethality to the boring stew of court negotiations, backstabbing, and peasant-trading. Rogues are the ultimate tricksters. Assassins have a sharper focus: killing. But they both deceive, beguile, and sneak. Let’s take a look at some of the abilities they have in common and some signature abilities unique to each. Both rogues and assassins learn one fighting style and one variation at first level. They pick up a smattering of other fighting styles and variations along their paths, and, significantly, they master one fighting style by level six. This is only two levels behind the time that warriors master a fighting style; rogues definitely hold their own in combat. In fact, taking a snapshot at 10th level, rogues have mastered and apprenticed as many styles as a warrior (though the warrior has also mastered a grand style, which the rogue has not). 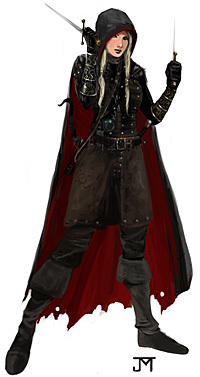 While the rogue can do very well in combat, he also picks up the most histories, skills, reputations, and talents in the game. No one has a wilder and more random life than a rogue! Starting right at first level, a rogue gets one extra history and reputation (ironically, the only other class to receive a reputation automatically at first level is the noble). The trend continues throughout the rogue’s career. If you want to play the ultimate jack-of-all-trades (and still master a few of them), rogue is your class. Now let’s talk signature abilities. The assassin has perhaps the most terrifying ability in the game, namely, assassination. Remember how in Spellbound Kingdoms, love and fear are the most powerful forces? They are so powerful that under the right circumstances, they can save your character from death. Most players try to keep a love or fear (or sometimes another inspiration) at a high level so that they can invoke it in dire circumstances and maintain narrative control of their character. In other words, cheat death. Well, an assassin can cut through all that. An assassin can kill regardless of the victim's inspirations. In Spellbound Kingdoms, when an assassin arrives on the scene, people notice. Both rogues and assassins get the false identity ability. This allows you to set up a fake identity with reputations, property, and at least one NPC who holds you as an inspiration. Any class can do this, of course, but it takes time and a lot of risk. Rogues and assassins get it for free, along with false reputation advances at subsequent levels. This almost allows you to play two different characters. Your true character might be a hardened, brooding mercenary while your false identity might be a dandy fop. If you’re thinking Scarlet Pimpernel or Locke Lamora, you’re thinking along the right lines. The rogue alone gets the Fool ability. No details on that today, but if you’re thinking “What could measure up to assassinate?” then let’s just say that Fool can leave you wishing you were only dead. "History" and "skill" are interchangeable terms as far as SK mechanics are concerned. "History" emphasizes that a character’s skills come from her history: what she has done, what she has learned, what she has witnessed. At each level, and often after every session, a character gains one history item. She has to place it in a skill that she used, or a history that she experienced, during the past level, session, or story. The player writes the history in one sentence or clause. Skills are thus completely open-ended. Many players, however, do enjoy having a skill list. In the rulebook, there is a list of possible skills (just as there is a list of possible inspirations). The list is by no means limiting, but it provides common ground and examples of reasonable history statements. There are also general guidelines and advice for writing your own histories. Finally, each prepared adventure contains sample histories for the players to choose from depending on the outcome of the adventure. Again, there is no requirement to choose from the list, but it can be fun to read through the histories that an adventure offers. Assuming a history or skill is relevant, a player can use it in two ways. First, he can use the history as a die size modifier to a characteristic check. The die size is increased by one for every point in the history up to three points. Thus a character with strength 7 and “Athletic conditioning (running and jumping) (2)” would roll a d10 on his check to jump a chasm (d6 for the strength increased by two die sizes for the relevant history). If the character has more than three points in the history, the second way to use a skill comes into play alongside the first. The character still gains the three die size increases from the history, but now he also rolls the history itself as a bonus die. For example, a very high-level noble with reason 11 and “Studied the Dynn inquisition (9)” would roll a d20, d4, and d8 to sense the motives of a Dynn inquisitioner (d20+d4 for the reason score increased three die sizes, and a d8 for his history value). To some extent, this models the adage that “80% of the benefit of something comes from the first 20% of the work you do towards it.” That is, the increase of three die sizes is often more valuable than the bonus die for specialization and a very high history score. However, the bonus die is far from negligible, especially at high levels where high target numbers become common. Also, diminishing returns allow the GM to award bonus history points with some regularity, even in the middle of sessions. This has been fun in playtesting. There are limits on the number of histories that can benefit you. As you age, your past fades, and old skills wither if not exercised to new use. Some characters may have to let old skills fade away completely in order to have the time to develop new skills. This depends on class, characteristics, experience choices, and more. The point is that time rushes on, history piles upon history, and no man can stop the roll of years. Reputations are similar to histories, and they also can fade with time if not reinforced. There are a few differences, however, and the main one is that reputations can be used against you. If your reputation with a group is negative, then another player or the GM can force you to roll your reputation die along with your social encounter die. If your reputation die exceeds your social encounter die, you fail in any attempt at friendship or persuasion, regardless of the target number. Depending on your group’s preferences, it can be amusing to roleplay the consequences of a failed reputation roll. Insults, mayhem, and the chance to earn an even worse reputation generally ensue!